Are you always on the golf course but your drives not going the way you want them to? Your game is only as good as the golf equipment you use, right down to the golf balls of your choice. If your golf clubs aren’t up to par (pun intended), you aren’t going to have many good games. Your goal must be to get the best clubs you can for the best possible price. Whether you are in need of a better launch angle, improved swing speed, greater distance with the perfect golf driver, you can improve your game. With the right clubs in your hands, you’ll no longer have to worry about your shots going where you want them to. There are tons of golf clubs on the market right now. They all claim to be the best out there, but we set out to find the clubs that would serve you well. After some extremely in-depth reviewing, we selected the five best golf clubs for the money for you. Our first set on the list is made for the younger golfers aged 9-12. It is from Tour Edge and is the boys’ edition. T﻿﻿our﻿﻿ Edge has outdone itself with the quality of these clubs, which are the perfect way for younger players to get into the game with great gear. The 8-piece set comes complete with a high-end carrying case that is of the backpack style. It has a ton of awesome clubs and features, as well as high ratings from everyone who has used it to date. Woods with a titanium matrix: These woods have the power and strength factors necessary to hit shots that travel higher and further than ever before. Hybrid with a great design: The hybrid club in the set is designed with young players in mind. It provides the best basis for improving their game. Versatile clubs in the set: Although the set only has 8 clubs, each one tailored to different roles. Junior golfers can quickly learn the personalities of each club and adapt them to their own play style. Included in the set are oversized irons, a high-powered driver, a putter, and the hybrid club. Very durable clubs: The clubs included in this set are made of stainless steel with graphite matrixes and titanium inlay. Every single club is durable for the stresses of a younger player. Users report having used these clubs for over 7 years without issues. Bag isn’t very durable: The bag provided with this set isn’t made for a lot of abuse—it can wear down quite easily and have holes in it soon. Not on the high-end of the market: These clubs are very well-priced, but they don’t have the quality you can expect from adult high-end club sets. This golf club set is awesome for your little boy or girl. Don’t let the “boys” tag on the clubs deter you from a great purchase of a durable set. If the bag is important to you, though, this may not be the best choice. Overall, a great starter set for kids. These clubs from Callaway are among the priciest on our list, but with good reason. They are also one of the best sets a woman can get to boost her golf game. 16-piece club set: In comparison to many of the other club sets on our list, the Strata Strata has 16 clubs in it. Others have 8 or 12, with only a couple having 16. This adds to the price but also to the versatility of the set, leaving it able to fill in for any role during a shot. Titanium driver design: Titanium in the drivers allow for improved strength when driving the ball. This improves the sheer power of the shot, allowing you to hit the ball harder and make it travel much higher and further than ever. Fairway woods are well-designed: The woods in this set are built with an aerodynamic shape. This allows for faster, more powerful shots that cross the fairways very easily. Better control due to technology: A special High Flying Technology design has been used in the design of the irons, hybrids, and wedges. This allows for much more control with each shot, which is very useful for women and men alike. The technology makes these clubs far more useful than their stainless-steel counterparts. 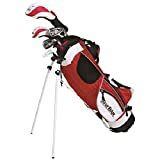 Stylish carrying bag: The backpack style carrying case easily fits all the clubs and is very comfortable indeed. The bag is also quite durable and provides easy, lightweight, fun carrying styles for you. Durable clubs: Because of the materials used in their design, the clubs are all extremely durable. They can withstand a lot of abuse over time. We noticed that the more powerful shots were well-damped and the clubs remained comfortable for extended use. Shorter clubs: Many people on the taller end of the spectrum find it a little awkward to use these clubs. Since they are designed for women—and women are on average shorter than men—it can be hard for you taller ladies out there to use them. Beginner quality: These clubs are meant for novice players, not for any pros out there. You should expect the quality to be the same—the woods can get dented through extensive use. Overall, these clubs are great for beginners. If you’re over 5’5”, you’ll have a little trouble getting used to the length of some of the clubs in the set. They are perfect for women to use, come with a great carrying case, and are very versatile. We can safely say that these are the best you can get for the money right now. The Vertex set from Winfield is an awesome set of clubs designed for male golf players. It has 12 clubs in the set and is very versatile indeed with multiple roles played by the clubs. Perfect for beginners: This set is almost exclusively meant for absolute beginners. It is also a good way for people who aren’t good at golf to improve their game. The design of the clubs and their versatility all help with novice players and their needs. Powerful driver club: The oversized driver has a deep face and has a lot of power packed into its head. It also has a sole plate that is designed to provide the maximum energy transfer from the driver to the ball. Hybrid #4 iron: In place of the long iron, this set has a hybrid iron. This replacement makes it far easier to hit the shots the long iron would be used for. Better shots on the mid-line performance irons: The #5-9 irons and the wedge are all built with deep soles in order to forgive errors in shots. These allow you to max out your golf game by adjusting better and finding more shot forgiveness. Putter is designed for control: The putter in the set has a bladed design for more precision in shots. It comes with a special aid for aligning your shots perfectly on the putting tee. Stand-friendly bag: The bag is made to hold clubs, as well as additional balls and tees. It can be slung over your back or carried like a backpack. There is an included extendable stand for better standing during play. Strictly for beginners: This is probably one of the only cons of the set—it is built for novices. As such, the durability isn’t as great as it could be. It is also more about game improvement than perfection. If you have golfing experience, we don’t recommend this for you. Winfield has done a great job with the Vertex, making it one of the best starter sets out there. For anything more than this, though, it doesn’t come up to par. If you’re an absolute novice in the game, use this set and watch as your game improves magically. Callaway is one of the best golfing suppliers out there and the Strata Plus for Men is one of their latest and greatest. Graphite construction: The shaft of the major clubs in this set are all made of graphite, which makes them lightweight and strong at the same time. The 3-wood is one of the best out there, and the 460 cc driver is oversized and good for longer shots. Mallet style putter: This putter is a good starter club. It is designed like a mallet for more accurate putting regardless of your skill level. A nice alignment aid is also incorporated into the end of the club. Lightweight bag: The bag is one of Strata line’s finest. It is durable and has pockets to hold accessories and balls. A stand is included to provide easier standing when playing on your own. Comfortable: According to many long-time users of this set, comfort is one of the top features. The grips, weight, and everything else are top of the line. Flex in shafts: The hard-hitting clubs all have a good amount of flex to prevent denting and cracking when hitting harder shots. Short for men over 6’: This set’s clubs can be a little on the short side if you’re a man over 6’ in height. 3-wood isn’t durable enough: If you’re hitting hard shots with this wood, you’re probably going to experience a broken club. The driver head is also quite fragile and can fly off during play. Overall, you should get this set if you aren’t a beginner in the game. It is very useful for those of you who have some golfing experience. Watch out for the 3-wood during play, as you may find it a little fragile. The complete club set from Callaway is perfect for men looking for better, more advanced clubs at a good price. Sweet spot is easy to find: The heads are bigger making it easier to find the sweet spot, especially on the 3 wood. Further distance with shots: The strong graphite shaft means shots travel a longer distance and go higher than ever. T-style putter: This provides better control when putting along with an alignment aid for more accurate shots. Hybrid in place of long iron: Allows you to hit harder and with more control, allowing for better improvement over time. Tend to be too long: These are meant for taller players. Anyone under 5’7” will have trouble using them properly. Feels cheap: Some of the drivers feel like they’re made of a cheaper material than they actually are. These clubs are a great buy if you’re a beginner who doesn’t care too much about quality. Be sure that you’re tall before you buy this set. The bag is one of the best parts of the set and is a good addition to your inventory. We recommend the Strata Strata Ultimate for Women, as well as the Winfield Vertex for Men. These are quite obviously the best two sets on our list. If you have any suggestions, tips, or concerns about the golf clubs on this list, be sure to let us know in the comments below. If you liked this list and found it useful, share it with your friends! They could use some great clubs, after all.